Hardy Dam is an interesting contrast. Built in 1931, this huge man-made structure is the largest hydroelectric plant in the Lower Peninsula and produces enough electricity for a city of 24,000 people. Yet upstream the Muskegon River has been turned into Hardy Dam Pond, 4,000-acre body of water with 50 miles of almost undeveloped shoreline including no private cottages or homes on it. Downstream Consumers Energy and local Boy Scout troops have teamed up to build Hardy Dam Rustic Nature Trail where at times it’s so quiet in the woods it’s hard to believe there are generators, power lines and spillways just upstream. 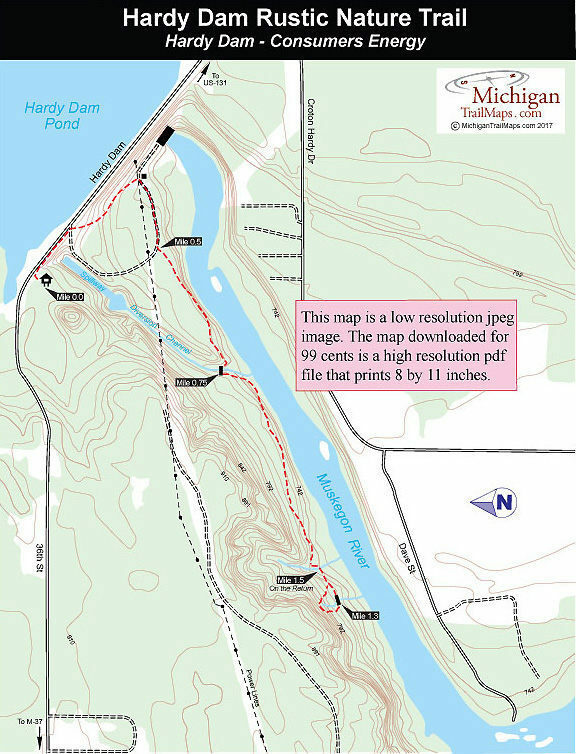 Together seeing the dam, even driving across it, and hiking this interpretive path makes for an interesting stop in eastern Newaygo County near the Mecosta county line. This is especially true for any family heading home on US-131 and is in need of a break to stretch the legs or burn off some excessive energy in the back of the mini-van. Hardy Dam Rustic Nature Trail is a point-to-point path with a small loop at the end. The entire hike, including the return, is an easy 2.75-mile outing. There are 26 numbered posts along it, though a few seem to be missing, that correspond to an interpretive brochure focusing on tree and plant identification. You get glimpses of the Muskegon River here and there but most of the time you’re hiking in a climax maple-beech forest that is stunning in the fall. Just on the west side of the dam is a marked parking area and trailhead along 36th Street. At the trailhead signs instruct you to follow the sidewalk east along the dam, past a huge spillway, to where a mowed lane descends down the south side of the earthen berm that is the Hardy Dam. At the base of it signs lead you along a gravel road that includes views of the dam, generators and power lines. This is a nature trail? Yes it is. At Mile 0.5 a large sign directs you to leave the gravel road and enter the woods on an actual foot path. Numbered posts appear almost immediately but they are easy to miss as the posts are short. The trail begins by following the edge of the river bluff to provide glimpses of the Muskegon River then swings inland and at Mile 0.75 crosses a stream in a small ravine on an impressive wooden bridge thoughtfully constructed by the Boy Scouts. The trail remains level on the other side and winds through a beech-maple climax forest with trees so tall there is little undergrowth. At one point you skirt steep bluffs to the right of you with a small spring seeping out of the hillside and then tip-toe across a small stream near post No. 22. 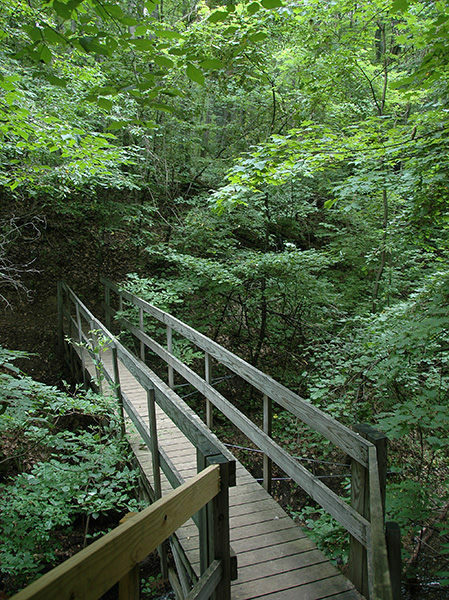 A larger stream with a foot bridge is reached at Mile 1.3 and at this point the trail follows the creek upstream and climbs into the bluffs. You loop back to the trail between posts No. 23 and No. 24 and head left, reaching post No. 22 at Mile 1.5. From here you backtrack 1.25 miles to the trailhead and parking area on 36th Street. There are no sources of drinking water or other facilities at the trailhead on 36th Street. 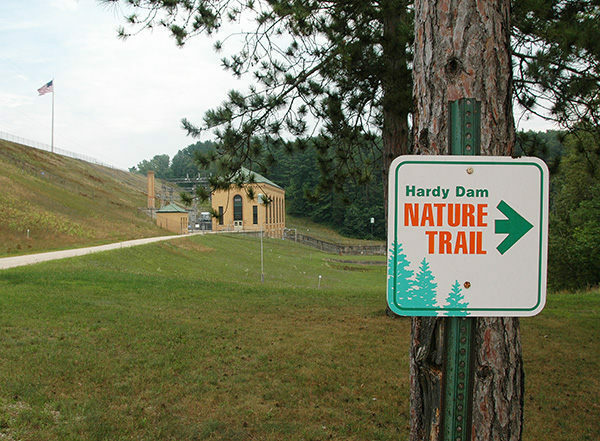 The Hardy Dam Rustic Nature Trail is open year round and there are no fees to hike it. From US-131, south of Big Rapids, depart at exit 125 and head west on Jefferson Road. Jefferson Road becomes 36th Street which continues west and then swings south at one point. Stay on it. 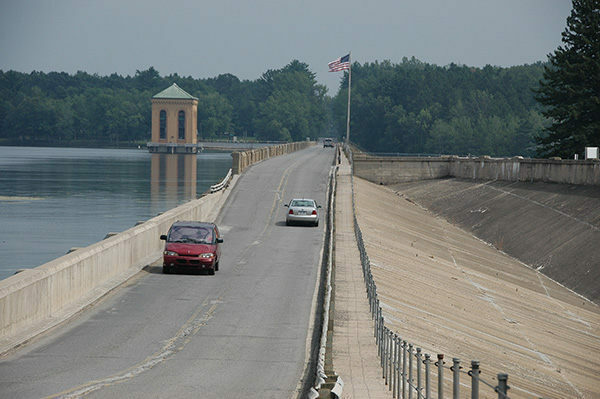 Within 8 miles from US-131 you’ll cross Hardy Dam. The trailhead is just on the west side of the dam. For more information contact Newaygo County Convention & Visitors Bureau (877-500-2570; www.newaygocountytourism.com).